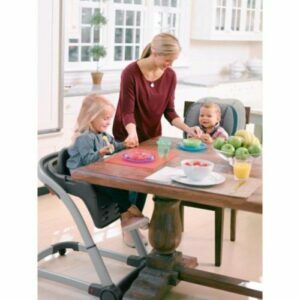 There are growing concerns about matters like ‘is there a better choice for my child when it comes to getting them a booster seat or high chair?’ and if your the one thinking this very thought then don’t fret and worry because we are here to put a little clarity into the situation and hopefully help you make the right choice for you and your parenting needs. I think every parent has there own way of thinking, parenting style, education, home and, simple, put a preference, so if that’s you and your as head-strong as some mothers are then I won’t persuade you either in either direction, but what I will try to do in this comparison review is to say ‘my reasoning and pro’s and con’s’. For me, it is an ideal seat if you want your child to be at the table and eye to eye with the rest of the older siblings and yourself of course. Some new age ways of thinking have suggested that this is important for early development and helps them feel equal and included, but personally, I like this because it feels more natural and almost loving if that makes sense. They usually come with huge trays and this is a lovely feature for getting them used to the actual dinner table without having to worry about the mess. That messy tray is all theirs to learn with, explore and become tactile in a safe environment. With all this learning going on the mess begins to mount up and the washing seems to be endless, from nappies to clothes, from toys right back to the tray’s and therefore the dishwasher being used is a God-send to help with lessening time spent cleaning, but also add a deeper level of cleaning to ensure the elimination of bacteria and mold spores. I love the concept of folding and hiding away where they can’t be seen and most these days can, but some older versions might not. This allows for those homes which are small in size to not feel stuffy and cluttered, just simply fold away and store. Lastly on the Pro’s is the ability to recline and this feature for younger babies is essential and if your’s were like mine they want a little reclining. Some Con’s are that they can be expensive and don’t fold away, which isn’t ideal for the homes that as suggested are small already. They can be hard to clean too, especially if they are wooden and also kids seem to grow out of them quickly and the fixed high chair with no-removable parts limits the age range. The booster for me is super-easy to clean and can get under, around and between some of those places that you can’t with a baby high chair. The mobility aspect is another awesome feature and can go in the car, sisters-in-law and everywhere you need to a drop of a hat, which is ideal for the mum’s like I was and on the move. The price for some is a huge factor and for good reason in times like these, so at a much cheaper price the booster seat is a nice add-on to the already mounting pro’s. I would say the general rule of thumb is for every $10 on a booster seat spent expect to pay $20 for the kids high chair. The self-feeding is another one not to be overlooked and this can make the booster seat a certain buy for some mothers who need to have this as a core function. Lastly, the booster seat can be used in conjunction with age development and as the child grows the seat can be used, so therefore until the child no longer needs one it can be there every step of the way, which is great for saving money. The seat might not always recline and therefore not suitable for babies 0-6 months and some may not have the strength to sit up yet until later in their life 9-10 months. Some seats have been known to not offer the essential eye contact and they might be out of view and be made to feel left out. Lastly, there are those who might say the style is a factor and the high chair is better from this perspective. My personal thoughts on this all is I prefer the high chair and like this for the reasons stated above, its a beautiful feature and looks nice in its place. This might not last the test of time, but it will endure until it is not fit for purpose, which is usually the 2 year mark.